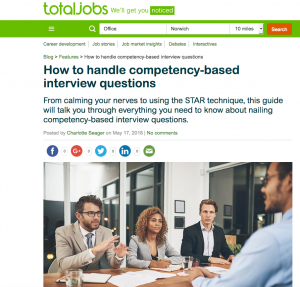 What’s a competency-based interview? As a freelancer, it’s at least 15 years since I had a job interview. Even then, I remember it as pretty bog standard. I have to admit to being rather clueless about the subject until I started working for new client Totaljobs. All that changed after I subbed three 10,000-word blogs on competency-based interviews for the UK-based jobs-board. Now I can reveal that competencies are the skills, behaviours and knowledge you bring to a role. At the interview, employers will ask open questions about real-life scenarios and you have to demonstrate your competencies. You might be wondering how a sub-editor can tackle copy about a subject they know nothing about. It’s not an unusual scenario. Subs may have little knowledge of a subject, but they know correct grammar and spelling when they see it (or not) and how to turn a yawn-making phrase into a snappy one. And, like all good subs, we never tire of checking facts several times from different sources. Take that, automated grammar checkers! Sub-editors are an endangered species in newspapers. But in the corporate world, I’m pleased to say that clients know their value. My client at Totaljobs, Brett Ackroyd, editor-in-chief, advice content, knew the complexity and length of the pieces he gave me made for a challenging and laborious sub-editing process. I very much welcomed the level of scrutiny to which Alison placed the insight, how she smoothed countless poorly-phrased sentences and how, after subbing 10,000-plus words, she still identified even the smallest of editorial issues. Her contribution increased the quality of the pieces significantly. I also welcomed her willingness to align with our in-house editing tools and processes. We’ll be working together again, no doubt. I’ll bet my competencies on that.